Chilaquiles (pronounced "chee-lah-KEE-lays") is a traditional dish found throughout Mexico. 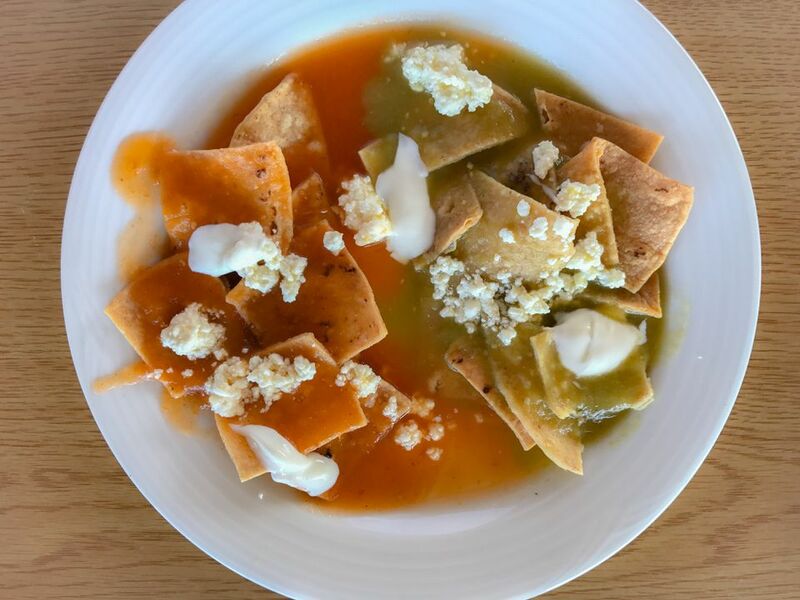 At its most basic, chilaquiles consists of fried tortilla strips simmered in red or green salsa or mole to soften the strips. This dish is great for using up leftovers because stale (or store-bought) tortillas can be used. It's often served with a side of refried beans. Chilaquiles is eaten daily in many Mexican homes, but you'll also find the dish served by restaurants, hotels, and street vendors. Throughout Mexico, regional variations abound. This comfort food is usually eaten for breakfast or brunch and has been called a "hangover helper" for those who drank too much the previous night. It's often served for tornaboda, which is close to morning following a long wedding reception. Chilaquiles contain the same ingredients as enchiladas, but chilaquiles takes much less time to prepare—only 15 minutes—because no rolling is required. The dish is also similar to nachos, but it's generally eaten with a fork rather than the hands. Chilaquiles can be confused with another common dish called migas, which means crumbs because it also contains tortilla strips and is eaten for breakfast. Some popular chilaquiles ingredients include fried or scrambled eggs, cheese, chiles, sour cream, raw onions, cilantro or chorizo. Meats include shredded beef or chicken, but chicken is the more common choice. In Mexico City, the tortillas are usually simmered in slightly tart green tomatillo sauce or spicy tomato sauce. Central Mexico, on the other hand, prefers crisp tortilla chips, so rather than simmering them in salsa, the salsa is poured onto the chips right before serving. Cooks in Guadalajara traditionally use cazuelas, a special cooking pot, to simmer chilaquiles until it becomes thick like polenta. In Sinaloa, chilaquiles can be prepared with white sauce rather than red or green. The name comes from Nahuatl, an ancient Aztec language, and means chilis and greens. The dish's introduction to the United States occurred in 1898 when a recipe appeared in The Spanish Cook cookbook. Though it's been around for many years, it's still a Mexican staple because it's versatile and is made using widely available ingredients that are cheap.